The timing of a story by the campaign finance reporters of the New York Times, and its placement in the paper’s national edition, is fraught with meaning. Articles in which the totemic names "Koch" or "Adelson" appear have a habit of being published in the prime time of an election cycle, and share the uncanny ability to float, bubble-like, to the front-page. Stories that deal with the liberal moneymen who finance the Democratic Party and its affiliates, by contrast, tend to appear after the fact or when nobody is looking, and, like ballast, fall to the back of the A section, obscured by ads for Tiffany’s, Burberry, and Zegna. I wonder why. A recent example: On the eve of Election Day 2013 the Times ran on its front page an article by John Eligon, "Koch Group Has Ambitions in Small Races," about local chapters of the Koch-affiliated Americans for Prosperity becoming involved in municipal politics. Fighting over bond issues and tax increases is the right of every American, including Americans who belong to organizations associated with Charles and David Koch; but the Times wants us to know that "the group has not been so welcome" in Coralville, Iowa, where the "nonpartisan campaign" for mayor "has become an informal referendum on the involvement of outsiders." And these outside agitators, even if their financial contribution is a pittance, are trying the patience of the local bosses. The article was a free advertisement and plea for assistance on behalf of Coralville’s tax-and-spend caucus. It did its work. The left-leaning mayoral candidate won. Another outsider, Joe Biden, phoned him with congratulations the next day. Congratulations that were, no doubt, "nonpartisan." It was not until Election Day itself, however, that the Times thought it fit to run a much more interesting, and potentially far more damaging, story on Democratic efforts to flood New Jersey with money in order to prevent Chris Christie from making gains in the state legislature. "Big Money Flows in New Jersey Races to Thwart Christie Agenda," by Nicholas Confessore, which also ran on the front-page, is an astonishing read, not only for the scope of outside spending that it details—some $35 million, much of it from a group tied to the ethically challenged George Norcross III—but also because the story informed the country, and Republican donors, of a huge power play at precisely the moment when nothing could be done to stop it. In this sense Confessore’s piece also did its work. Only a single New Jersey Democrat lost on Election Night. "In this new world of Citizens United," a union official told Confessore, "you want to take advantage of all the opportunities you can to advance the candidates you want to support." I would love to know whether the Times asked the union official whether her logic also applied to donors to Republican and conservative causes; I somehow doubt it. What cannot be doubted is that the left-wing billionaires who "want to take advantage of all the opportunities" have had a fantastic couple of years. In 2012 President Barack Obama’s campaign outraised and outspent Mitt Romney’s, and though Team Red spent more in total than Team Blue, Team Blue certainly got more for its money. A recent study by the Center for Public Integrity shows that Big Labor spent around $44 million in 38 state elections in 2012, with pro-Democratic groups outspending Republican ones by more than $8 million. And in 2013 just three billionaires—radical environmentalist Tom Steyer; outgoing New York City mayor Michael Bloomberg; and Facebook impresario Mark Zuckerberg—have spent more than $25 million to prevent construction of the Keystone pipeline, regulate guns, and give amnesty to illegal immigrants. 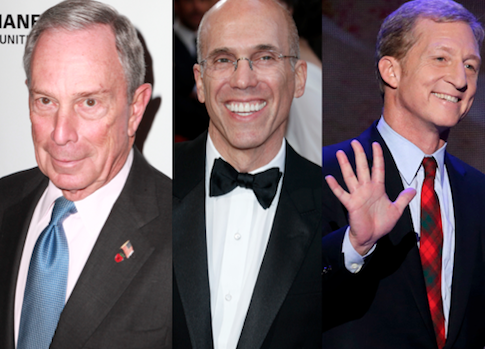 You and I are living, Politico says, in the "Year of the Liberal Billionaire." Has there been any other kind? I ask the question knowing full well that conservative and libertarian billionaires also contribute to politicians and institutions to advance their interests and ideas. But, when closely examined, the differences between the suppositions of billionaires grow somewhat thin. The consensus shared by most of the American elite is well established and long enduring and objectively liberal: a love of economic growth; rhetorical support for fiscal responsibility; a desire to play nice with others and, post Iraq, to avoid war; a belief that the benefits to the economy of comprehensive immigration reform outweigh social cohesion and the costs to low- and non-skilled native workers; an expansive interpretation of all rights, constitutional and judicial, except the right to keep and bear arms; a desire to reduce trade barriers with all nations regardless of regime or labor conditions or the costs, again, to low-skill native industries easily displaced to the other side of the world; a secular-materialist view of nature and support for its protection; and a commitment to multiculturalism and diversity in pursuit of equality. It is one’s allegiance to these ideas, and not one’s income or the particular industry in which one works, that is the true measure of membership in the Caste. Quibbling over the edges of this worldview—over which programs to cut or expand, which taxes to lower or increase, which industries to subsidize and which to not, how best to reduce carbon dioxide emissions and power America—is a matter of means not ends. Nor is it a question of one side working for selfish purposes and the other being devoted to a higher morality. Only the half-baked can think that particular charge withstands scrutiny. We’ve known since Plato that all human action, no matter how wrongheaded, is taken with a view toward some good; and that it is difficult for human beings, even Democrats, to separate their view of the good from their view of what’s good for them. Jeffrey Katzenberg may have aggressively pushed his candidates to back a trade deal with China because he believes free trade brings peace and prosperity to everyone involved; or he may have done it because his film studio would profit immensely from the deal; or he may have done it for both reasons, or for neither reason, or for some other reason entirely; in the end the reason does not matter because he did what he thought was good. He did what he thought was right. Why Katzenberg and Steyer and Bloomberg and Zuckerberg and Bezos and Soros do what they do matters far less than how reporters interpret what they are doing. Michael Bloomberg pours millions into races in Colorado and Virginia in order to elect candidates who will restrict the sale and ownership of guns, and the media covers it far, far differently than when some random Iowans belonging to Americans for Prosperity try to elect a mayor who won’t raise their trash collection fees. Steyer can spend close to $8 million helping the mediocre and corrupt McAuliffe barely win the Virginia’s governor mansion, and he gets a friendly Politico profile, "Inside a green billionaire’s Virginia crusade," where we read that in Virginia in 2013 Steyer spent "more money, on a per-vote basis, than the famously prolific conservative donors Sheldon and Miriam Adelson spent in the 2012 presidential election." If Adelson outspends Steyer on a per-vote basis in 2014, will he get Steyer's press? We may never know. Outside groups affiliated with the GOP have spent much less in 2013 than they have in the recent past, and there are fissures between the business community and the Republicans who support the Tea Party and reject the consensus outlined above. It is for this reason that the year of the liberal billionaire is unlikely to end anytime soon. The Times last week carried a story on, naturally, page A17 that was headlined "Groups Mobilize to Aid Democrats in ’14 Data Arms Race." The article was pegged to the winter meeting of the Democracy Alliance, the secretive group of progressive donors who meet twice annually to coordinate philanthropic giving to liberal institutions and political giving to organizations and candidates. The meeting was held at the luxe Mandarin Oriental hotel, which sports views of the Potomac, the Washington Monument, the Jefferson Memorial, and the Capitol, and whose main restaurant, City Zen, features a six-course tasting menu that is worth all $135 per person (wine pairing included). "The smart use of data and analytics is essential to winning the political and policy battles that are important to liberals," Soros lieutenant Michael Vachon said in a potted and obvious quote to the Times. More important is what he did not say: Winning political and policy battles is essential to rewarding unions, greens, social workers, trial lawyers, Hollywood studios, cable companies, Silicon Valley corporations, local, state, and federal government employees, and the rest of the Democratic coalition. I learned recently that when the muckraker Lincoln Steffens was writing his book The Shame of the Cities, there was one question in particular he posed to sources. Arriving in a new town, he would begin interviews by asking, "Who runs?" If Steffens were magically to appear in the nation’s capital in the early twenty-first century, perhaps inside the Hillwood Room at the Mandarin Oriental, he would not find it necessary even to ask. "Year of the liberal billionaire." Who runs, indeed. This entry was posted in Columns and tagged Citizens United, Democracy Alliance, Democratic Donors, George Soros, Jeffrey Katzenberg, Koch Brothers, Mark Zuckerberg, Michael Bloomberg, Sheldon Adelson. Bookmark the permalink.